Brunston Castle Golf Club in South Ayrshire has announced a special seasonal offer on its Club subscription fees. Until the end of 2009 only, an annual membership can be purchased for from only £250, with no joining fee. This is an amazing saving of 33% on the standard annual membership subscription fee, and would make an ideal Christmas present for all golf lovers. 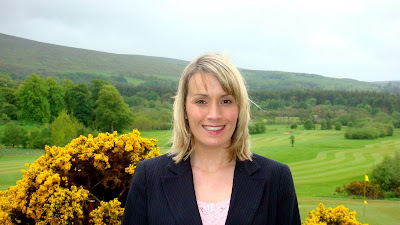 In announcing the special offer, Brunston Castle general manager Cheryl Steven (pictured above) said that she was looking forward to building on the progress that the Club had made over the past twelve months as it headed into 2010. “We have had a successful season in 2009, due mainly to increased use of the Clubhouse facility, including numerous weddings and special events, in addition to increased business through the restaurant. The Clubhouse has developed a reputation for providing a warm environment in which to unwind after a round of golf, but is also becoming increasingly popular for non-golfers to enjoy good food, in pleasant surroundings. There are currently 626 Ayrshire business stories permanently archived on this site. To locate those of most interest to you, please use the site search facility in the top left hand corner of this page. Type your search term in the white box, then click the magnifying glass symbol.